Madonna & Co. left Malawai today after a six-day visit during which the children at the orphanage threw rocks at the paparazzi. 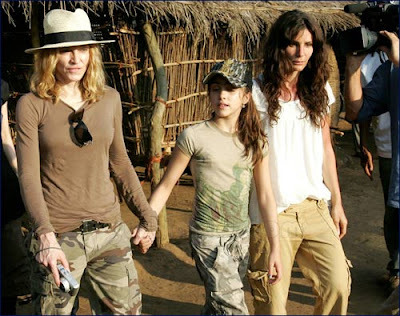 Madonna and Lourdes brought David to visit the orphanage sans Guy Ritchie, who stayed home with Rocco. No purchasing of children occurred during the trip. Madonna did, however just collaborate on a song with Justin Timberlake in preparation for her new album which rumors to rock. You go ahead with your bad self. Spring Break Like You've Never Seen! I'm A Pitt Now, Bee-atch!